That six-over figure left him lurching towards the clubhouse shade like someone emerging from the fog of an anaesthetic. "I don't know!" the Clara man responded candidly when asked if he felt he still had it within himself to find a path back into this tournament. Lowry's round amounted to a grim, monotone struggle that left him questioning the pressure he'd put on himself just to get to Augusta National, let alone navigate his way around the toughest country estate in golf. "It's the hardest course in the world when it's getting away from you," he said flatly. "Because you're hitting good shots to 30 feet and you've got a putt with ten feet of break in it. Look, I tried my best. I can't put my finger on it right now. I'll just have to go out tomorrow, try to shoot a good score and see what happens." His desire for early momentum fell quick victim to a pushed opening drive into the trees, drawing the wise counsel of caddie Bo Martin to take his "medicine" and punch a conservative escape rather than risk a low, narrow corridor that, clearly, had caught Lowry's eye. "I didn't hit that bad a tee-shot," he'd sighed after, already stymied by the Old Testament severity of Augusta's punishments. Martin's advice was good, but the rain-softened course had been stiffened for opening day by flags that might as well have been protected by razor wire. In this instance, the pin was back right, just above a wicked ridge, that managed to spirit Lowry's sublime approach back down the hill. He two-putted for bogey, then drove into a fairway bunker down the right on two - "another yard left and it was perfect..." - still eventually missing a four-footer for birdie. Ostensibly, this might have implied that driving gremlins - Lowry has tested maybe 30 drivers and used nine in tournament play since his win in Abu Dhabi - were about to sabotage his score. But, in truth, this was never about a single club in his bag. In fact, it would be, as he put it, "a comedy of errors" through the middle part of his round that effectively pushed Lowry firmly onto the back foot. True, he'd looked like a man still trying to orient himself to his surrounds in the early holes, albeit sinking from 25 feet for his one and only birdie of the day on three to huge cheers from an audible overload of Irish in the gallery. The ubiquitous Kerry jerseys were visible as were those of Kilkenny and Dublin too, Augusta National's strict dress-code rule "no sports jerseys permitted" clearly suspended for the sprawling GAA family. Given the presence of his All-Ireland-winning father Brendan outside the ropes too, it was a reminder of the broad urban and rural affection for Lowry, one calling into colour the Offaly man's memorable description of his first Masters in 2015. He didn't make the cut that year, yet would recall fondly "It was just... I'd imagine it's like the first time you play in Croke Park and you stand there, looking around... and you're not used to it." But this is a different Lowry now, a golfer who firmly believed he could contend here and the support just couldn't get him going yesterday. On the contrary, his round almost became a guerilla operation just to save pars given those wicked pin positions and just the faintest sense that his swing simply wasn't where he or coach Neil Manchip needed it to be. The flag on the par-three sixth - back right - might as well have been a chimney pot on a sloping roof and Lowry did well to come off the green with a par, meaning he was still level for the round. But a pulled drive on seven brought bogey and an even starker pull on eight wrecked any chance of birdieing the par-five eighth. He then missed a four-footer for par on nine, arriving at the turn two-over and now wrestling with all manner of different maladies in his game. What followed on ten, effectively, killed him. A wonderful, huge cut off the tee left him with a simple nine iron to the green. But Lowry caught the ball flat, flopping it into a hollow at the front of the green and, thus, leaking another bogey. "It was just brain-dead really," he'd reflect after. "You know from there I kind of felt like I could still shoot a score which you can around here but, yeah... just didn't do it." He ended up bunkered at the front of the notorious twelfth for another dropped shot, then - trying to attack 13 - drove sharp left into Rae's Creek. Another bogey there, then three putts on 15 for a missed birdie opportunity "kind of summed up my whole day", before bogey again on the short sixteenth. 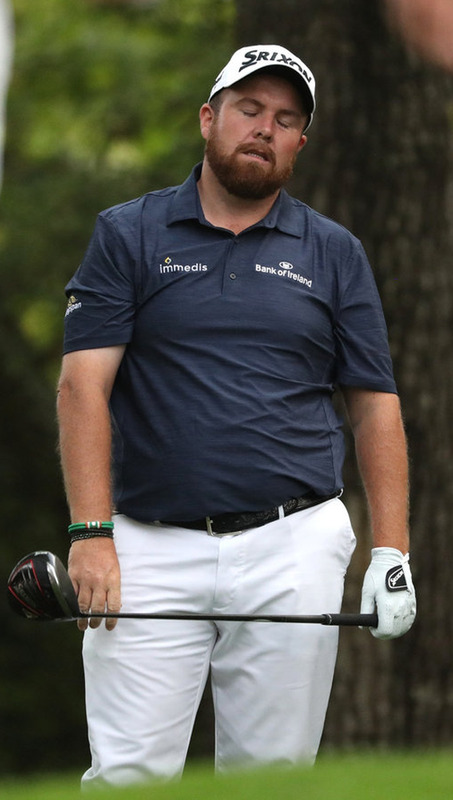 The 78 represents Lowry's second worst score around Augusta (he shot 79s in both 2016 and '17) and leaves him probably requiring his best ever Masters score (sub-68) to make the weekend now. His visible deflation was, thus, wholly understandable, the sense of a precipitous loss of faith almost. When Augusta turns against you, things start happening too fast. "I kept on just making mistake after mistake," said Lowry. "I don't know, I felt like I was going great in practice. I was very confident going out there. It just didn't happen. "The thing is everybody talks about the Masters. It almost gets annoying when you're on the border of getting in, people annoying you about it. And then you come here and shoot 78 in the first round. What's the point being here when you're doing that? "Like, I think I put too much pressure on myself to get here and then I put too much pressure on myself when I get here to try and do well. So it's all I think internal, you know in my own head. So I just need to kind of relax and let the golf take care of itself. "It's just like I said during the week or maybe I was just trying to say it, I don't know... ah, happy to be here...but am I happy to be here now?